Ballet is the foundation of all dance forms. Body placement, flexibility, alignment, strength and technique are achieved through barre and centre floor work. 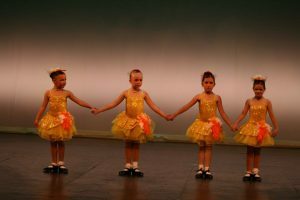 TPDS offers ballet classes from tinytot levels (ages 3-5) to senior levels. All Ballet classes are taught under the RAD syllabus. Tap focuses on musical phrasing and the complexity of rhythms with the challenge of making melodies with the feet. TPDS offers Tap for kindercombo students to senior levels. to students 6 years and up in both recreational and competitive. only offered in our competitive program. For those dancers who have achieved the necessary classical technique and strength. Pointe class concentrates on the transference of ballet steps from demi-pointe to pointe. Admittance to a pointe class with permission of instructor only. imagination, musical awareness and joy of dance. can be chosen for the full year program or 12 week session. open to students in our higher levels. Our Acro programs are taught under the Acrobatic Arts Syllabus. of gymnastics, balancing, limbering, tumbling and basic contortions. stronger, flexible and fearless. This is open to students 6 yrs & up. character development, improvisation, mime and song & dance.